When I first moved to Buenos Aires I knew nothing about the city except that the seasons were upside down and that I should try the steak. Somehow I had assumed that the city got its name from the refreshing mountain breezes that blew down each day from the ridges of the High Pampas, wafting gently across the white sand beaches before disappearing into the turquoise sea. I imagined the city as some kind of South American Nice, occupying a small shelf of land between hills and ocean, perhaps with a kitschy but lovable landmark (like the Rio Jesus) set up on a nearby mountaintop, kissed in the evening by the last rosy rays of the sinking sun as it descended into the Atlantic. On arrival, of course, I found out that Buenos Aires was actually Sacramento-on-Sea, with the added attraction of the sea being a dark brown color. The name had nothing to do with geography, but had rather been taken from the patron saint of good winds, to whom anguished sailors had presumably prayed after foundering on the hot malarial flatlands at the mouth of the River Plate. The nearest bit of significant topography lay in Córdoba, nine hundred kilometers to the northwest, and everywhere else was table-flat grassland, which, as luck would have it, was also highly flammable. For many days, a thick layer of smoke from burning scrub in the nearby river delta has covered the capital region, much of Entre Ríos province and parts of Uruguay, turning the name “Buenos Aires” into an outright mockery. The amount of smoke is unprecedented - apparently there are some three hundred fires burning throughout the area, and there is no hope of rain for at least the next few days. The fires take hold in the deep root systems of plants and smolder partially below ground, making them hard to find and extinguish. Meanwhile the city has been suffering. The bus terminal has closed regularly, and the downtown airport (which mainly serves internal destinations) has had to stop landings at times. Major highways are blocked on many nights because of the terrible visibility (though it has taken several of the country's signature pile-ups to convince the authorities that something might have to be done). There are dark rumors about the fires. It is clear that they were started intentionally, but no one can say for certain who did it, or why. Looming in the background is a sharp conflict between farmers (who want to plow cows into the ground in order to raise more lucrative soybeans) and the government (which does not relish the idea of convincing voters to switch to tofu steaks). The government has been trying to impose crippling export taxes on the farmers, and is suggesting that they started the brush fires as a way of applying pressure back. Since roadblocks by protesters in the countryside left many stores in Buenos Aires without beef(!) last month, this theory has some legs in the capital. For their part, the farmers have accused the government of starting the fires as a provocation. There is a third theory, that the rise in soy production may have prompted ranchers to look for pasture in more marginal areas like the delta islands, leading them to light fires in order to clear the land, but again nobody knows. A unique feature of politics in Argentina is that not only are all three of these conspiracy theories likely to be true at once, but that there is probably an even more outlandish actual reason for why the countryside is burning which we will only learn about ten to fifteen years from now. 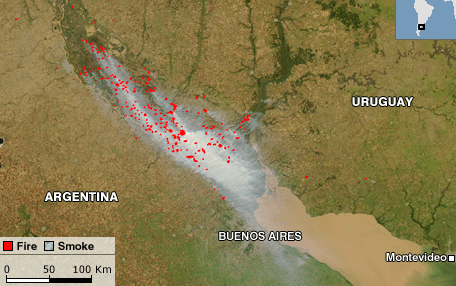 The smoke attack is a kind of model Argentine crisis. It affects everyone, its underlying causes are obscure even though the immediate causes are clear, the government has done everything it can to pretend it's not happening before taking ineffective half-measures, and the resilient capital city has been able to shrug off something that would have caused significant protest (once the smoke cleared) anywhere else. This isn't so much civic apathy as it is recognition by the Argentines that their country is still far from being un país en serio, as Kirchner's old slogan had it. For all the economic growth since the 2002 devaluation, public institutions here remain corrupt and brittle, and it is not obvious at all how to fix them. People here deserve better, but the political class is far more adept at staying in power than it is at wielding it.